Attach unit to your existing cold water pressure washer and you have the power of hot water to quickly melt away grease and grime. The pressure washer water heater allows you the flexibility of using hot water on those stubborn jobs such as grease, gum, or graffiti that require the impact of hot water to get the job done right. It will save you money by getting the job done faster. When the gun is pulled the burner automatically fires and stops when it is released. Simply quick couple the Hot Box's 5ft. jumper hose to almost ANY pressure washer, and attach the pressure washer's hose, gun, wand and nozzles to the outlet on the Hot Box. This unit continuously heats 4gpm up to 195° with the adjustable thermostat. This unit features a stainless steel coil skin, burner cover, exhaust flue, outer body cover, a large 7.5 gallon see through fuel tank, pneumatic ball bearing tires with a solid 3/4 axle and a 35ft gfci power cord. 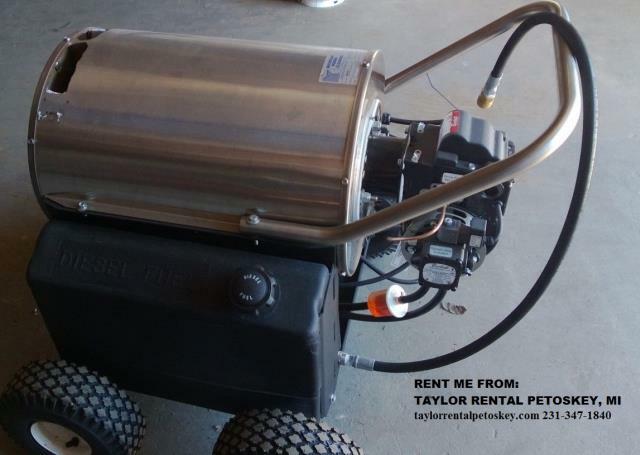 It only needs 6 amps of 115 volts electricity and heats with diesel, fuel oil or kerosene and is available in 4000 psi rated models. 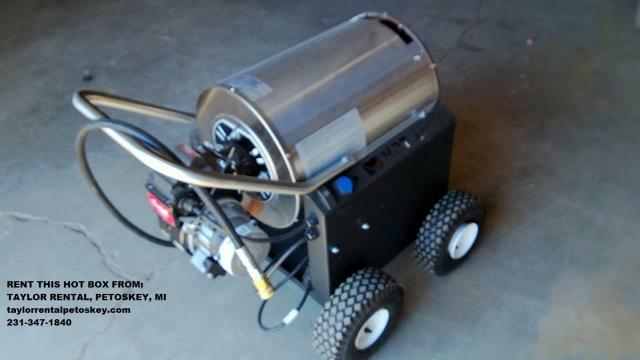 * Please call us with any questions you may have about our pressure washer water heater hotbox rentals in Petoskey, Northern Michigan & The Upper Peninsula.